Philadelphia - Ross Schriftman, producer and screenwriter of My Million Dollar Mom, is pleased to announce the leading cast members for his film that addresses the issue of a mother's growing dementia condition and the son who must make a difficult decision between career and family. Based on the book of the same name by Ross Schriftman, My Million Dollar Mom is a film about a mother diagnosed with Alzheimer's just as her son is offered his last chance to be elected to Congress. He must decide between his life-long dream and his mom's wishes to remain in her home under his care. 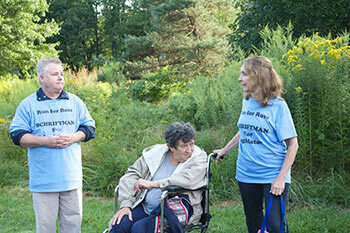 Pete Postiglione, portrays Ross Schriftman, and is offered a chance to run for Congress just as his mother, Shirley, is diagnosed with Alzheimer's disease. Postiglione is a Philadelphia native who has appeared in film and television shows such as Silver Linings Playbook and The West Wing and was nominated for an Emmy for hosting "Dig Philly" which is produced by NBC/Universal. "I was thrilled to take this truly dramatic role in which I had the opportunity to stretch and grow," said Postiglione. "The intensity and the magnitude of each scene was not always in the dialogue, but rather in what was not said." Susan Moses portrays Shirley Schriftman, Ross' mother. Moses has appeared in Invincible and played Schmitty's mother in It's Always Sunny in Philadelphia. She has been a guest host on QVC and taught voice and movement at the University of Miami. "I was overwhelmed by the richness of Shirley's life and the countless people she touched with her incredible goodness, love of life and her undying spirit," said Moses. Currie Graham, who portrays the Governor of Pennsylvania. Graham has appeared in television shows including Ten Days in the Valley, Murder in the First, Chicago P.D., Westworld, NYPD Blue, Suddenly Susan and House M.D. Christopher Mann, who portrays Marvin Stern, a political mentor to Ross. Mann has appeared in films such as Loving and in numerous television shows including The Wire and Law and Order. Patsy Meck, who portrays Gladys, Shirley's best friend. Meck has appeared in films such as Silver Linings Playbook and American Hustle. Hayden Saunier, portrays the state party chairperson. Saunier has appeared in films such as The Sixth Sense and television shows such as House of Cards. Tim Daly, portrays Chuck, Ross' friend and younger co-worker. Daly has appeared in films such as Dragon. Volieda "Vee" Webb, protrays Annie, a care giver for Shirley. Webb has appeared in films such as American Hustle and Silver Linings Playbook. "It is thrilling to have such a talented team of actors to help bring my mother Shirley's story to life," said Schriftman. "The book and film have been a labor of love for me and I'm gratified to see all the pieces come together into something that can be used to show the world that people with Alzheimer's truly have something to give." The film is scheduled to be released in the Spring of 2018 in conjunction with Mother's Day. To learn more about the film, visit www.mymilliondollarmom.com. Based on the book of the same name by Ross Schriftman, My Million Dollar Mom is a film about a mother diagnosed with Alzheimer's just as her son is offered his last chance to be elected to Congress. He must decide between his life-long dream and his mom's wishes to remain in her home under his care. The scriptfor the feature film was selected as a semi-finalist in Story Pros' screenwriting contest in the drama category. Schriftman's production company was accepted as a member of the Filmmakers Collaborative, a non-profit that assists independent filmmakers with documentaries and dramas that promote causes such as dementia awareness. More information can be found at www.mymilliondollarmom.com and www.facebook.com/mymilliondollarmom or by contacting Ross Schriftman at mymilliondollarmom@gmail.com. Editor's Note: Interviews are available with Ross Schriftman and members of the film's cast. To schedule an interview, please contact Debbie Goetz Media Connections at 215-630-5408 or email Debbie Goetz at dgoetz@dgmediaconnections.com. Pete and Susan as Ross and Shirley (Courtesy of My Million Dollar Mom): Pete Postiglione, portraying Ross Schriftman and Susan Moses portraying Shirley Schrftman, in My Million Dollar Mom, a film that addresses the issue of a mother's growing dementia condition and the son who must make a difficult decision between career and family. 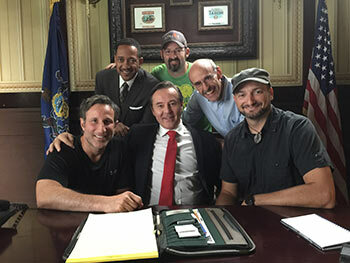 Cast and Crew (Courtesy of My Million Dollar Mom): Actors Currie Graham, Chris Mann and Pete Postiglione pose during the filming of My Million Dollar Mom with Ross Schriftman, Screenwriter, Kevin Hackenberg, Director and Joe Herrigan, Director of Photography. 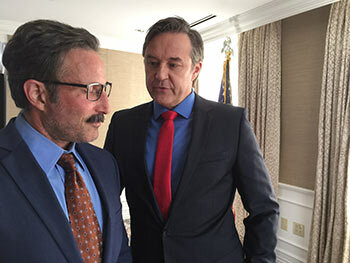 Pete and Currie Graham (Courtesy of My Million Dollar Mom): Peter Postiglione, portraying Ross Schriftman, and Currie Graham, portraying the Governor of Pennsylvania, during a key film scene that takes place in the Governor's office in Harrisburg, Pa.
David Lach, Patsy Meck and Susan Moses (Courtesy of My Million Dollar Mom): (L to R) David Lach, portraying the husband of Shirley Schriftman's best friend Gladys, is pictured with Patsy Meck, portraying Gladys, and Susan Moses, portraying Shirley Schriftman in the film My Million Dollar Mom. Schriftman's production company was accepted as a member of the Filmmakers Collaborative; a non-profit that assists independent filmmakers with documentaries and dramas that promote a cause such as dementia awareness.